To my own amazement, I discovered between in my CD collection 2 recordings which escaped to my attention until now. Another Hindemith "Mathis de Maler" and a Beethoven 3. Both from a concert of 1978, where Eugen Jochum conducts the New York Philharmonic. Other recordings with this orchester are unknown to me. A Philips Boxset published back in 1999 contained the ""Et in spiritum Sanctum" from Bach's Hohe Messe. It has been added to the list. October 2017: 2 new Parsifal recordings added: 1957 (München) and 1972 (Bayreuth), bringing the total of complete Parsifal recordings on 5 now! All recording listings have been updated. P.S. I'll remove the dark background now on all pages one by one, together with making (small) updates there. April 2017: Due to several circumstances, I was not able to make any update to this Eugen Jochum site. From now on, I'll start making small updates and make corrections, awaiting a redesign of the entire site. All pages with recording-lists have been updated. The most important news is the release of ALL DGG RECORDINGS in one 42-CD box, including the most obscure recordings such as those from Figaro, unavailable for many years, as well as the rarely found first release of the Beethoven Violinconcerto. EMI also provided a compilation of all recordings. Those were in the last years more or less available on a regular base. In 2015, INA (France) released an 8-CD box, containing hitherto unpublished recordings with the Orchestre National de France (ONdF). This box containes a previously unknown Jochum recording (1964)of the Tchaikovsky Violinconcerto with Christian Ferras. This work is new to the list of recorded works by Eugen Jochum. Also, I aquired some live recordings from the internet: those have not been included in the list yet, but will follow soon. September 2011: A new Tahra CD with a very important addition to the discography: Strauss - Vier letzte Lieder (with Annelies Kupper). Also on this new CD: Ravel, Johann Strauss (! ), Handel, Mozart. January 12, 2011. Some new releases of old live-recording added to the discography. In particular, the recording of the 2nd. Symphony of Wilhelm Furtwängler is an important addition. February 10, 2008. Eugen Jochum fame spread even to the popular Internet-Channel Youtube! On the Video-page, I added two links as well as some photographs of Eugen Jochum dating from around 1935. December 9, 2007. The text about the opera's of Richard Strauß was extended with some notices to the mysterious origins of the recording of the Tanz der 7 Schleier from Salome. It is found on the opera-page. November 17, 2007. This update includes several new recordings. The most interesting to Jochum-collectors are the two Rehearsal-fragments with Beethoven Ouverture Egmont and Symphonie nr. 6. These were recorded during a visit with the Bamberger Symphoniker in Japan. Go to the lists of recordings. June 19, 2006. A page added on Eugen Jochum's birth town: Babenhausen, which I visited on the occasion of a Mozart recital by Mrs. Veronica Jochum - von Moltke, with declamation by Mr. Klaus von Welser which was given in the old Fuggerschloß. May 27, 2006. Mr. Simon Clarck sent me a list of live performances containing many live recordings I was not aware of. These will be added to the lists in the next days. Also, I received a letter from Prof. Glenda Maurice in which she kindly describes some of her memories of Eugen Jochum. These are cited on this page. May 24, 2006: Today, I received several recordings from Mr. David Long. The most important are the recordings of Hartmann's 3rd symphony and the Metamorphosen of Richard Strauss. On May 20, an update of the repertoire page was made and a page with my favorite Bruckner interpretations was added. April 2006: update of the discography (ca. 17 new recordings added). The page dealing with the september 1986 concerts was enriched with 12 new pictures from the respective concerts. Recently, I digitized the Eugen Jochum video's and put them on DVD, enabling me to capture some pictures for the website. This prompted me to add a page with an annotated inventory of the Video's with Eugen Jochum conducting. Mr. David Long provide me with an extended list of recordings present in his collection. One items is a real novelty: a recording of the 3rd Symphony of Karl Amadeus Hartmann! This is a very important recording indeed! Also new to the repertoire are Sibelius' violinconcerto with Bronislaw Gimpel and the Metamorphosen of Richard Strauss. Both important additions for the Eugen Jochum discography. Recently, recordings of two Brahms-evenings given in 1967 with the Los Angeles Philharmonic in the Hollywood Bowl (with Ruggiero Ricci and Jean-marie Darre) surfaced and these have been added to the list. The updates of November 2005 include: a large update of the discography (from 455 recordings to 500). An annotated overview of the available opera recordings and a page containing some notes (update Nov. 6 2005) about the work Jochum did for 20th Century composers (both under the link "Repertoire") have been added. Currently, 3 DVD's with recordings of Eugen Jochum are available: 2 EMI DVD's (one DVD containing only some short pieces with Teresa Berganza) and one DVD with Bruckner 8 (Tokyo, Bamberger 1982). On Nov. 5, I added these recordings and also some live-recordings with the Concertgebouw orchestra (Mozart 40 from 1943, Frank Martin and another Heppener recording). With these additions, the number of 500 recordings is reached on Nov. 5, 2005! I started with a literature-list, available since Nov. 5. Finaly, a chronological complete (!) list of all concerts with the Concertgebouw orkest was added on Nov. 5, 2005 (under the link Amsterdam activities). 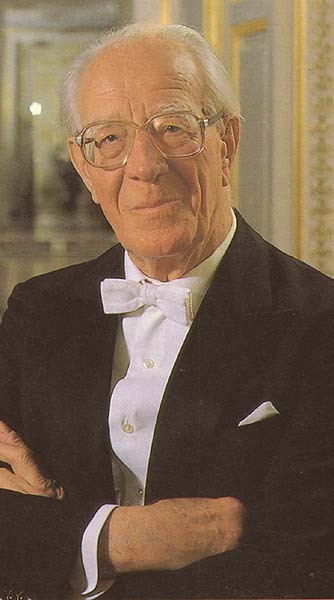 In 2002, several commemorations of the 100th birthday have been held in honor of this great German conductor. Among others, concerts were conducted in Ottobeuren. In these concerts Eugen Jochum's daughter Veronica, being a renowed pianist herself, also played a great part. Several concerts were given in Berlin with the aim of honoring the memory of Eugen Jochum. TAHRA published a splendid Eugen Jochum Centenary Edition which is a true representation of the legacy of the conductor. It should be considered a true biography in sound, providing recordings from 1933 up to 1986. The emphasis usually laid on the Bruckner interpretations of Eugen Jochum is totally absent from this set. From these recordings emerges a great Wagner, Reger, Brahms, Schubert and Beethoven conductor. On October 10 2002, a special stamp was released, carrying a photograph of Eugen Jochum made during a rehearsal in Bayreuth. Januar 2000, I attended a piano recital given by Mrs. V. Jochum in the castle of Bourglinster (Luxembourg). Most impressive was her performance of the music of Günther Schuller. After the concert, she kindly introduced me to Mr. J. Wenandy of the Eugen Jochum society. Since then, we keep contact about new developments concerning the musical heritage of her father. In the summer of 2005, Mrs. Veronica Jochum-von Moltke and Mrs. Romana Jochum kindly invited me in the house of Eugen Jochum. At this occasion, they provided me with numerous interesting details about the life and work of Eugen Jochum. Thanks to Dr. J. Godfroid (Deurne, Belgium) some very interesting recorded are added to the lists and to the collection. Especially the recording of Ariadne auf Naxos from 1964 is an important addition. Earlier this year (April 2001) Dr. Godfroid had already provided the important (live -recorded Zauberflöte(! ), and a new Mozart (Symph. 30) with a spectacular Brahms 4th. Mr. H. Kimura (USA) is thanked for his numerous contributions and additions to the list of recordings of Eugen Jochum as well as to provide evaluation copies of several recordings. Among these is the highly rated Parsifal recording from Bayreuth, as well as the Bruckner/Mozart performance given in Tokyo, September 1986. These are among the best of the performances Eugen Jochum gave. The information provided by Mr. Kurz (USA), Mr. D. Long (UK), Mr. Youn-Jin Rhee (South Korea), Mr. M. Gray (UK) and Mr. M. Gartz (USA) is gratefully acknowledged. They all provided important information concerning recordings. The aim of providing a near-complete discography of Maestro Eugen Jochum cannot be reached without help from readers of this web-site. Therefore, any information on existing recordings is gratefully accepted. The discussion of the music conducted by Eugen Jochum will help to produce a sort of key to the understanding of his personality. This is mainly done in the context of the discussion on his Amsterdam activities. An attempt is furthermore made to present a complete as possible discography / index of recordings of Eugen Jochum. All information presented here is mainly derived from my own Jochum - collection and from helpful readers, but also from various other sources. I would appreciate very much if you could attend me to any missing items or point out corrections to be made. If you have any recordings available for me ( cf. list of missing items), I would also be very thankful. Mail corrections, additions or trade records. Thank you! You are visitor numer: since 1997.